I will no longer be watching the comments page after The Sims 4 launches on September 4, 2014. 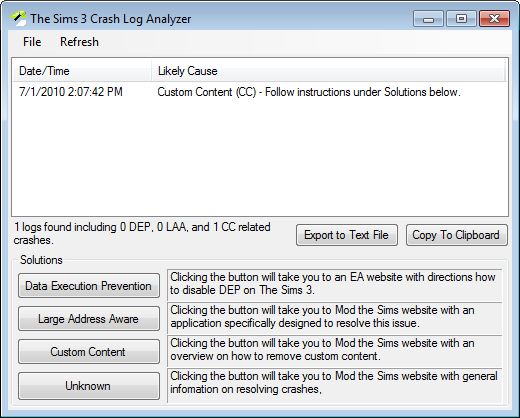 The Sims 3 Crash Log Analyzer (CLA) parses crash logs (xcpt*.txt) in the the Documents\Electronic Arts\The Sims 3 directory. It then attempts to discover what most likely caused the crash which CLA displays under the "Likely Cause" column. This is a tool to help diagnose crashes. It is not a miracle worker. -Microsoft .NET Framework 4.0 Client Profile. Mac OS X is not supported. -An internet connection is required to get the names of The Sims 3 executables. If you don't have an internet connection, it will ask for a "*.plf" file. Download the current version here and point to it when it requests it. Upon opening CLA, you will see a list of crashes and their likely causes. You can click on the corresponding buttons under solutions for assistance in solving those specific issues. If you are getting a lot of "Unknowns," you may either click on "Export to Text File" which prompts you to save it or click on "Copy BB Code" which copies the data to your clipboard to be pasted in the comments (see below) or the official Sims 3 Forums. CLA does not delete any logs by default. If you wish to delete the logs, you can do so under the File menu. Please note that download threads are not for game help and support. If you are getting a lot of unknown crashes, you can use the "Copy to Clipboard" button and paste the results in the comments section. This information may be used to expand the library of crashes the application can recognize. Please be aware that is it very unlikely reporting unknown crashes will result in good, immediate advice to fix the crashes. I would recommend looking here for a list of things to try to fix the problem. If you happen to figure out what fixed the crashes you reported previously, please provide an update so that I can perhaps automate the detection of that specific type of crash for people that experience the same problem. Sim Jett and members of the official The Sims 3 forums for testing and research. ts3cla.zip | Description: 1.69.43 - Minor update to stop skuversion.txt nag. 3. Install the Microsoft .NET Framework 4.0 Client Profile if you don't have it already. Other than that, extract, run, and delete when done. Too bad, this is a cool program. *GASP* OMIGOSH, my game makes building anything even slightly medium scaled virtually impossible because it has always kept on crashing, I shall have to test this tool out!! Thank you so much, this will be most useful. What directory are the crash logs in (assuming it generates them)? Are they .txt and .mdmp files? Thank you so much for this new tool.You have already provided so much help with your LAA.Now its bedtime,but I'll check it carefully tomorrow.Big hugs. Thanks for such a neat tool! this is actually perfect timing. my game actually crashed randomly yesterday, but luckily i wasn't too far into it or anything. thank you so much for this. i'm going to try it out. Thank you for this tool. Unfortunately 7 out of my 8 crashes are unidentified*, but one was found to be a LAA problem, so I downloaded your LAA-tool to see if it helps. *) They look similar to wescole07's crashes, so I'm not going to attach them here. Additionally they're older and I don't know the exact cause and situation when they happened, so I guess adding them would not be helpful. #11 21st Aug 2010 at 9:57 AM Last edited by ielena : 21st Aug 2010 at 10:24 AM. It crash randomly while playing, have custom content installed. #12 21st Aug 2010 at 10:18 AM Last edited by Mehrlicht : 21st Aug 2010 at 10:54 AM. After installing your LAA tool I just had two crashes. They are "Unknown",like in the previous reports. 1) 26/07/2010 Was decorating a house.Was trying to recolor the " Rose Bouquet" from "Wedded Bliss" created by Purplepaws.The flowers were on a table against a wall and as I wanted to click them with the design tool it was not responding well and....crash to desktop. 05/08/2010 New try...After loading the game and the lot I was working on, pressed "F4" instead of "tab" ...And...the game began the process of opening the store. I didn't want that and immediatly tried to close it...CRASH to desktop. #14 21st Aug 2010 at 3:41 PM Last edited by captnmatt91 : 21st Aug 2010 at 4:45 PM. Might I just add to the superb comments above me that this is an AWESOME tool. Mk. So I had five crash logs dating back to June one was a LAA and I already fixed that-thank you again. The only things I can honestly remember is that during gameplay are the majority of crashes.. I don't ever go into town in fear of it crashing but now with the FAA thing Ill give it a shot and see how it does. Mainly what I do before I play is that I use Delphy's Sims 3 Dashboard and clear nearly all of the cache and fix any corrupted files (though I haven't had any for a while) and then go in the game a play. I don't really have any issues after I do all that but it might hiccup on me a few times. So yes I do have CC loll. #15 21st Aug 2010 at 4:23 PM Last edited by christmas fear : 21st Aug 2010 at 4:35 PM. -Does it crash while loading? none of those crashes were from loading. -Do you have custom content installed? -Have you changed anything between crashing and not crashing? from the most recent crash, i've deleted a package that was a mod which took of the fade on sims while zooming in. i haven't had problems since then, but i don't think that was what did it. as for the earlier crashes, they happened in create a sim. i don't have any 'custom skins' installed, but those sims were ones that used those skintones. i'm pretty sure 2 of the crashes were because of that. and the problem was fixed when i deleted the sims with that 'black' skintone. there was one crash that happened around the time i was trying a challenge (it was the bachelor/bachelorette challenge) and while i was creating the fourth sim or so, it randomly crashed. that cause has been unknown. i haven't had create a sim problems after those incidents, though. -What version of The Sims 3 and Expansions do you have installed? i have the sims 3 base, world adventures, high end loft, and ambitions. it's all patched to 4.2. That might be a DEP crash. <unknown module> is often indicitative of a DEP crash. I don't know why it didn't flag that. Those three are practically identical. Were those three the Create-A-Sim crashes you described? As for all the rest, I noted them in an archive. Thank you so much for your quick reply.Well,a DEP crash...I thought that it would no more happen, since I have followed all advices to prevent it.Maybe have missed something. Should I add all EPS and Sps? If the highest you have is Ambitions, you'd want to do add Ambitions (TS3EP02.exe) to the exception list. If the highest you have is World Adventures, you'd want to add World Adventures. You shouldn't need to add any that are below it because they aren't ran. I think you may be the fix to my random crashing to the desktop! Thanks a lot for your precious info. I have two unknowns, which crashed randomly during gameplay. I remember a glorious day when my game didn't CTD, but that was months ago, and I believe it was before I got Ambitions. Those are both very interesting. MSCTF has to do with a Microsoft Text Service and d3d9 obviously is the Direct3D 9 core. You might try updating you graphics driver and running a stability test on it like FurMark (which would also tell you the temp of the card). I'm thinking about adding code to make CLA automatically detect Custom Content, report version numbers, and report which games are installed because even if the launcher says you are fully patched, you might not be. It is difficult to know how many crashes are due to version conflicts between expansions/stuff packs. I love this tool thank you!! I have 2 unknowns so I thought I would post here. Not that I know of! Thank you so much for making such a useful tool! I'm so thankful for this tool--I don't understand these things at all, and have never posted them before because I'm too embarrassed, lol. My game doesn't crash while loading, but does crash randomly.